Numbered 215/300 in ink on the back and with the artist's emboss stamped star and in the numbered 215/300 and stamp Venus Bleue the Yves Klein Exemplaire No. Editions Galerie Bonnier, Geneva. Blue pigment on plaster base. Height 67 cm. Certificate enclosed the "Venus Bleue the Yves Klein" signed R. Klein Moquay and numbered 215/300. Good condition. Insignificant scratch marks by the edge of the legs. Minor "handle marks" at the upper back. Minor color changes on the back of the right shoulder. Insignificant scratch marks at the lower back. The edition is limited to 300 copies and each copy is numbered and emboss stamped with the artist's star. Additions to this edition are about 50 copies, emboss stamped with a star and numbered with Roman numerals. These editions are reserved for the artist imitation and are separate, outside the edition. It was in 1970 that Rotraut Klein-Moquay and Jan Runnqvist at Galerie Bonnier decided to complete one of Yves Klein's projects in the implementation of the edition of "Venus Bleue". 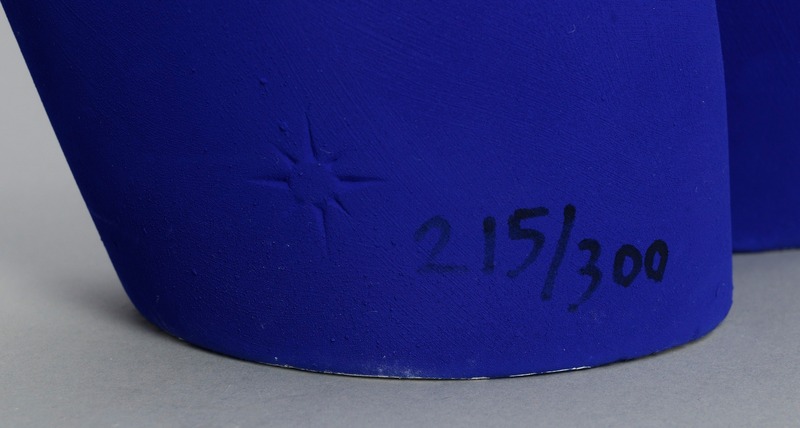 Certificate: "Venus Bleue de Yves Klein" signerat R. Klein Moquay and numbered 215/300.